As we know, PVC coated flexible conduit outside is Rohs PVC, inside is galvanized steel or stainless steel conduit. PVC can stop water, oil, the acid and alkali. Inside steel make conduit work longer. It is widely used in electric and electronics industry, to protect wire and cables. It has five advantages compared with flexible metal conduits and plastic corrugated conduits. General, steel is easy to be occurrence of corrosion in wet situation. And now steel conduit is coated by PVC, PVC can stop water. So PVC coated flexible conduit can work longer than general flexible metal conduit. PVC coated flexible conduit’s outside is Rohs PVC, and Rohs PVC is a kinds of good fire proof material. So it is fire-proof too. Rohs PVC can stop the water, oil, the acid and alkali, to make the inside steel more stable than ordinary cable conduits. Compared with plastic and metal cable conduit, it is more smooth in the outside and inside. So it is easy to put the wire or cables in it, and move them easily too. The appearance of flexible cable conduit like bellows, but PVC coated flexible conduit outside is smooth. It could be more smooth and beautiful by increasing the thickness of PVC during the production. Now flexible metal conduit and plastic flexible conduit are more and more popular in our daily life. PVC coated flexible conduit has they are common advantages, and the price also competitive. 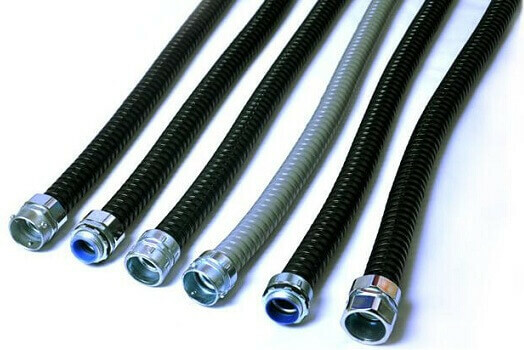 We think the PVC coated flexible conduit could be more widely used in the electric and electronics in the near future. If you have any ideas about PVC coated flexible conduit, welcome to send us email (sailor@flexconduit.com) for any assistance.